Buying the right bedding can make a big difference and have a big impact on the look and the luxury of a bedroom, whether it is a child's bedroom, a master bedroom, or a guest bedroom. There are many different options when it comes to choosing bedding. Primarily, you will need to ensure that any bedding sets you choose are the right size for your bed, and if you already have a duvet and pillows, make sure that the covers are the same size as these. You can also choose from a huge variety of different designs and styles, and then there is the choice of materials for the covers, thread counts, and more. While it can seem baffling at first, making the right choice when you first buy bed linen means that you won't have to replace the items too quickly. Delicate floral trails adorn this softly textural jacquard weave, inspired by a Paul Balin embroidered silk and dating from the time of Louis XV. In a soft, silvery grey colourway, the cotton rich jacquard weave reverses to a plain poly cotton percale in coordinating tones. Front: 62% Cotton, 38% Polyester. Curtains, Pillowcases & Throw: Front & Reverse: Polycotton. Delicate floral trails adorn this softly textural jacquard weave, inspired by a Paul Balin embroidered silk and dating from the time of Louis XV. In a subtle amethyst purple colourway, the cotton rich jacquard weave reverses to a plain poly cotton percale in coordinating tones. Willow Tree is a modern interpretation of a willow pattern toile in a grey colourway. The simplicity of the design gives it a tranquil feel. Bed Linen and Curtains: 100% Cotton. Originally inspired by a Sanderson archive document, Chiswick Grove has been reinterpreted in a loose painterly style with vibrant birds singing out from the branches of an exquisite tree pattern. The design's incredibly elegant duvet cover is available in four sizes: single, double, king and super king. Taken from the Sanderson wallpaper of the same name, Protea Flower is a delicate design, with its floral blooms symbolising diversity, courage and strength. The 100% cotton percale duvet cover is available in single, double, king and super king sizes, with soft pink and green protea flowers decorating the 220 thread count ivory base. The duvet's reverse features an all-over geometric floral pattern. An elegantly placed protea flower sits perfectly on the range's Oxford pillowcase (measuring 74 x 48 + 5cms) which is available separately. Sanderson bedding is known for the production of good quality bed linen at affordable rates, and we strive to ensure that our own prices are competitive. 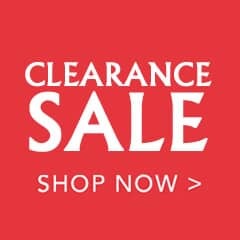 What's more, we regularly offer discounts on these and other products, including those in the Sanderson Clearance Sale. If you are looking for Sanderson products that are no longer being produced, you can check out our end of line offers. Just Linen is the official bedding website for Dawson's Department Store, providing excellent customer service and competitive prices on some of the biggest names in home d�cor. Call us with any questions or call in to Dawson's, where you can see every homeware and gardenware item that we sell. If you place an order over �50 today, we will deliver the item free of charge to your UK address. Sanderson has a number of bed linen ranges, suitable for use in the master bedroom or guest bedroom, as well as Little Sanderson bedding, which is designed primarily for use in a child's bedroom. 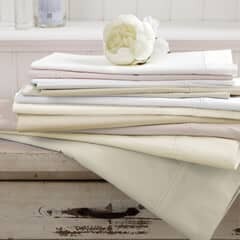 All Sanderson bed linen is manufactured from easy-care cotton. Cotton is a natural fibre that is used in linen because of the many beneficial properties it possesses. Cotton is soft and flexible, so it moves with your body when you roll during the night. It is also breathable, and it will keep you warm during the winter months and cool you down during the summer months, thanks to its thermal retention properties. Cotton is also easy to dye and work with to create unique designs which means that you can enjoy some great looking designs. 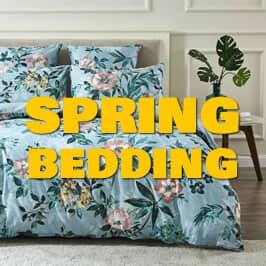 Sanderson bedding items are a modern take on floral designs, in a lot of cases, although they also do a range of plain dye bedding items, which you can read more about below. Colours vary from hushed neutral tones to more striking and bold colour palettes. Whatever style of bedroom, and whatever colour chart you are working with, you are sure to find a great variety of bedding and bed linen products that will match existing d�cor or complement your existing scheme. Bed linen sets typically include a duvet cover and a single pillow case for single sets and two pillows for king size and larger. In some cases, you can order an alternative style of pillow case, or you can order additional cases. Although sleep experts do not recommend sleeping with more than two pillows, you may use additional pillows when reading or using the laptop, or otherwise sitting up at bed time. Plain dye bedding doesn't have to be boring. 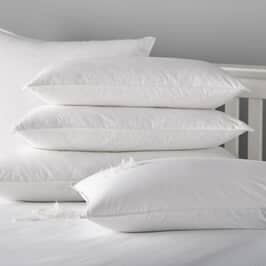 Plain dye duvet covers and pillow cases are especially useful if you are looking to improve the d�cor of a guest room. Guest rooms tend to be decorated in neutral colours, and you can either use bold colours to create a striking design, or you can add further neutral colours. Neutral colours are often considered a good choice for a bedroom, because anything that is too bold or striking can detract from the environment. A busy d�cor can actually prevent you, or your guests, from getting to sleep. Neutral colours can also be beneficial if you change the d�cor of the room. You can change the d�cor without having to go out and buy brand new bedding and other items. Plain dye bed linen comes in the same range of materials and options as any other Sanderson bed linen. They offer 180 thread count polycotton blends, as well as a pure Pima cotton with 300 thread count for a truly luxurious linen finish. Thread counts are not the be all and end all of linen quality, but they do make a big difference. Anything from 180 and higher is considered good quality, while 300 is a luxury bed linen scale. At Just Linen we aim to keep prices as competitive as possible by regularly checking the market and minimising our costs. As well as ensuring that we consistently provide high quality products and good prices, we regularly offer discounts and sales even on our most popular ranges from some of the biggest brands. The Sanderson bedding clearance sale page offers a selection of both patterned and plain dye bedding with large discounts. 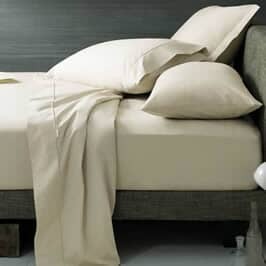 These items are still eligible for our free delivery offer, if you spend more than �50, which offers you even greater savings and gives you access to some of the most luxurious, best looking, and high quality bed linen products on the market, at cut prices. We also have an end of line page. Bed linen companies, like fashion designers, change their ranges and lines regularly. In order to do this, they also have to end particular lines, refreshing their catalogue and keeping the interest of customers. While this offers access to new designs, it can leave customers struggling to find replacement pillow cases, sheets, or duvet covers. Rather than buying a brand new set to replace just a single item of linen, you can browse through the selection of Sanderson bedding end of line products. 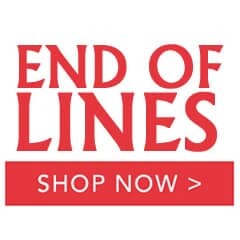 Another great reason to check out our end of line ranges is because you can often pick up a bargain on items that have been reduced in price simply because they are last year's design, rather than the brand new and latest listing. Little Sanderson bedding is the name of the bedding range, designed for use in a son or daughter's bedroom, and offering the same high level of quality that Sanderson has become renowned for. Designs include the Pretty Ponies, Dogs in Clogs, and the Treasure Map design. 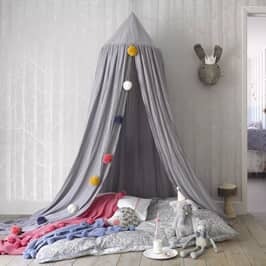 The linen is made from cotton, and you will also find items like blankets to add extra design features and give additional warmth during the night. The Little Sanderson bedding ranges are popular, because they combine great looking design with high quality products. Getting the right bed linen is important. Duvet covers and pillow cases, blankets and throws, can all enhance the sleeping experience, while the choice of design acts to improve the look of the room where they are used. You can buy print covers, as well as plain dye equivalents, and you can also choose from the popular selection of kids bedding called Little Sanderson bedding. Choose the size and style you want, the items you need in the set, and then simply place your order to receive your goods within a few days. Just Linen is the official bedding and bed linen website of Dawson's Department Store. You can browse our products right here on the site, buy using our secure ordering system, and enjoy free delivery on all orders placed, over �50. 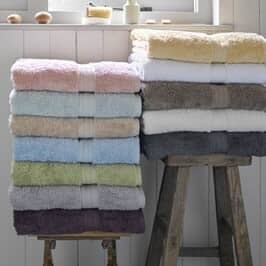 Alternatively, give us a call with any questions or queries, or call in to Dawson's where you can see our entire catalogue of bed linen, homeware, and gardenware items. I made Sanderson Chelsea curtains in 1969 and in 2017 I bought a Super King Bed Set and Curtains for the bathroom. They are superb and look as if they too shall last 48 years but I wont So wonderful to have the bedroom matching after that long time. Thank you Just linen. 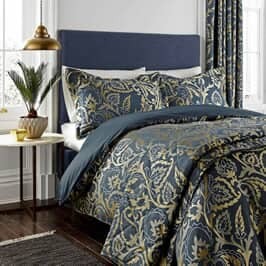 I am being tempted to buy a Throw.It is not always possible to find quality like this Sanderson bedding. The dogs are so grateful to lie on natural fabrics rather than nylon type mixtures.Really more than 5 stars are appropriate. LOVELY DESIGN AND COLOURWAY. HAS GIVEN A FRESH FEEL TO BEDROOM.VERY MODERN LOOKING.DISPATCHED QUICKLY RECEIVED ON TIME.STAFF VERY HELPFUL ABOUT PRODUCT AND QUIERIES I HAD WHEN MATCHING OTHER ITEMS EXCELLENT SERVICE AND BEST PRICE FOUND.ALWAYS LOVED SANDERSON SO HOPE LASTS AS LONG AS MY PREVIOUS SET WHICH STILL LOOKS NEW AND I JUST WANTED A CHANGE.WELL DONE DAWSONS. Omg I just LOVE this bedset. Fast delivery. Well packaged. EXCELLENT price. Its the best bedset Ive ever owned. I have another Sanderson pink bedset a Sheridan bought from this company but they in no way match up to the quality elegance of the China Blue. Im VERY happy. Arrived in less than 48 hours my duvet cover and pillowcases are absolutely gorgeous top quality and excellent price. Have bought all our bedding and towels from JustLinen for some years now and nowhere else comes close for service price and quality.